Unfortunately, 50,000 people are injured in bicycle accidents every year. A bicyclist is extremely vulnerable to injury when struck by a car. 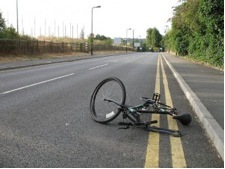 Bicycle accidents are caused by a motorist's negligence or inattentiveness while operating his vehicle. Many times a driver will turn directly in front of a bicyclist or pull out into traffic in front of the bicyclist. Sometimes a driver won't give a bicycle enough space while passing either forcing the bicyclist off of the road striking the cyclist with the side of the car or the side-view mirror. Often, after parking a car, a motorist will open the door into the path of an oncoming bicyclist propelling him over the car door. A medical doctor riding his bicycle to work at National Institute of Health (NIH) was struck by a pickup truck making a left hand turn. Because of fractures to his hand, our client was not able to return to work in the emergency room. The driver who caused the accident fled the scene. We were able to pursue the claim for injuries with the doctor’s own car insurance company including his sizable lost wage claim. A cyclist and a car both came to a stop at a traffic signal. When the light turned green, the driver attempted to beat the cyclist by accelerating to 20 mph. In doing so, the driver veered into the cyclist and the cyclist was thrown off his bike and landed on the road. By interviewing witnesses, our firm was able to assist the local police department in determining the driver of the striking vehicle. We were able to recover for our client his medical bills, lost wages and a large amount for his considerable pain and suffering. A cyclist was crossing an intersection at the crosswalk when she was hit by a car making a right turn. The driver failed to see the cyclist. Our client suffered facial, head and leg injuries. She was a research scientist commuting to NIH to begin her work day. Our client faced no recovery based on the state of Maryland bicycle law prohibiting riding on sidewalks. By researching this issue, we were able to locate Montgomery County exception to the State law there-by permitting our client to recover for her injuries as well as permitting her to be reimbursed for her torn clothes and damaged laptop.